Build Change CEO Dr. Elizabeth Hausler joined an esteemed group of social entrepreneurs, policymakers and donors in a panel discussion to explore how best to harness the power of partnerships between nonprofits and government agencies. 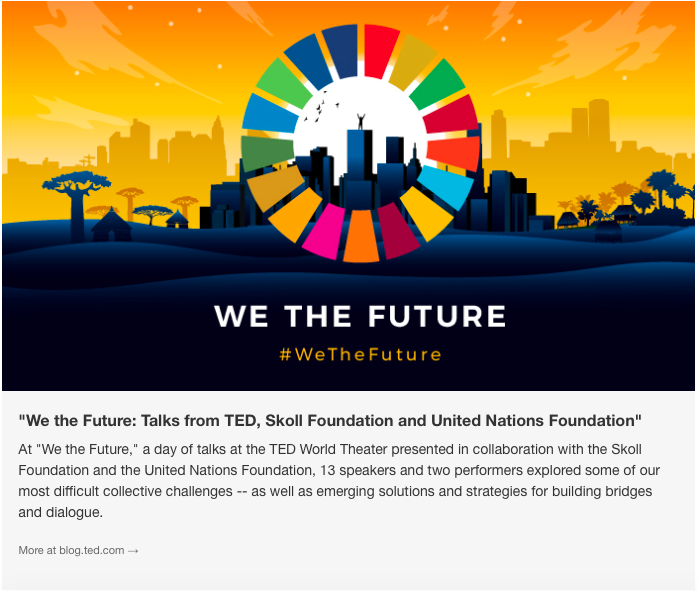 The Sept. 26 event marked the launch of the new Scaling Pathways initiative, a partnership of the World Economic Forum (WEF), the Skoll Foundation, the Schwab Foundation for Social Entrepreneurship, the US Agency for International Development (USAID), Mercy Corps and Duke University’s Center for the Advancement of Social Entrepreneurship (CASE). 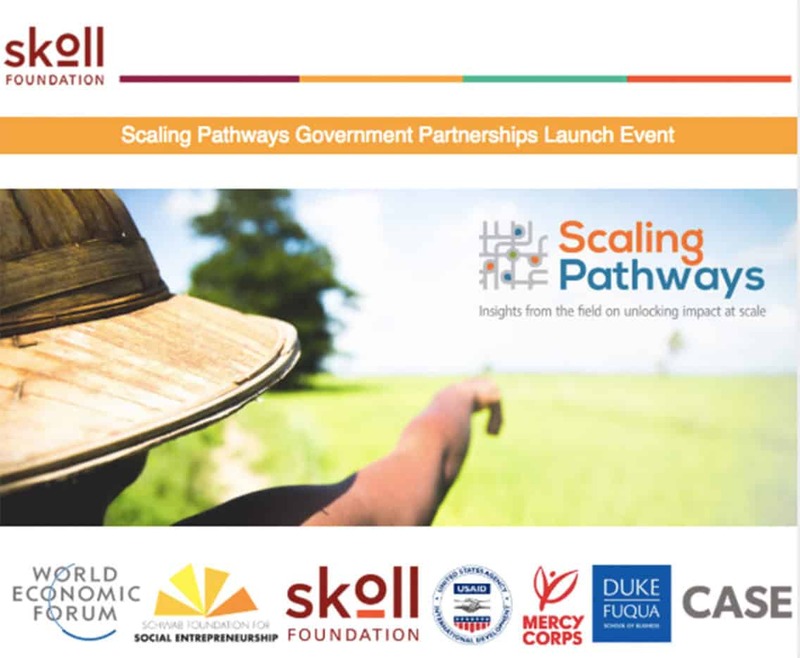 Scaling Pathways published a new report, “Leveraging Government Partnerships for Scaled Impact,” as part of the event. Tom is a Senior Product Manager in the Model Product Management team, focusing on the North Atlantic Hurricane Model suite of products. 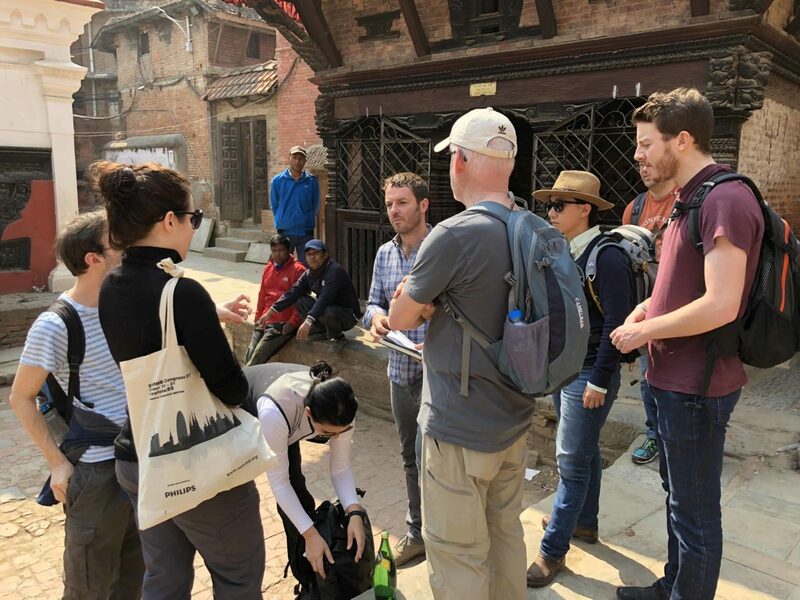 He joined fellow employees from RMS and RMS clients on our annual Impact Trek in Nepal during March this year. 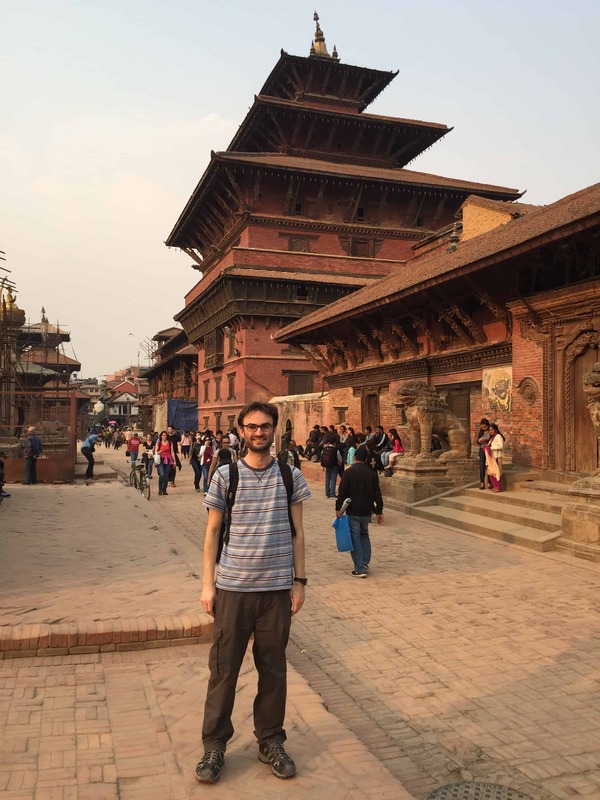 This is Tom’s account of his time in Nepal. 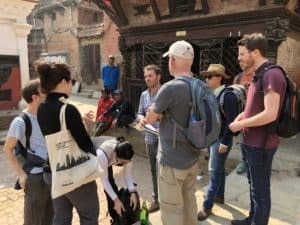 Arriving in Kathmandu for the 2018 RMS Impact Trek, I was already aware of the many years that RMS has provided support for Build Change and its work in areas worst hit by catastrophic disasters. 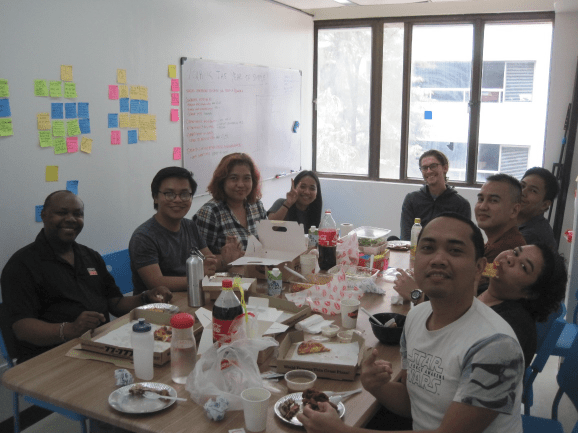 Our first day in the Build Change office was a crash course in their local objectives and challenges. Day Two saw us on a field trip to nearby Kirtipur to survey common building practices. It was a lot of information to process and it was not immediately clear to me what “impact” we could make during our short visit. For the month of February, I was able to be at home with my family for a bit of a break between international locations. Luckily, while I was in the area, Elizabeth Hausler (Build Change’s Founder & CEO) was the keynote speaker at the California Polytechnic’s Architectural Engineering Department’s Structural Forum. It was great to see her speak about all of the projects I’ve seen in my travels, and reminded me of the incredible team I’ve been so lucky to meet and work alongside over the past year! While at home, I was able to help the Build Change team remotely. I developed a “Retrofit Card” for Unreinforced Masonry/Confined Masonry one-story buildings in Colombia, and also met with the Indonesian engineers about out-of-plane designs of walls for the school retrofit they are working on. I also helped review the final construction documents for the school retrofit, which I am so excited will be completed soon! 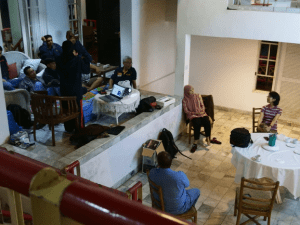 I saw the completion of the retrofits on the first 2 buildings in Indonesia while I was staying with the team there, and am looking forward to seeing the rest of the project come to fruition. Before I took off for the Philippines in mid-March, I was able to get to know the team in Manila a bit. We had a great Skype call to get me prepared, and get me excited about going back to the field! My first few weeks in the Philippines have been full of a lot of getting up to speed and getting to know the team besides my former student at Cal Poly, Carl Fosholt, and I look forward to working on the exciting projects they have going on! “Press for Progress” is our motto this month as we celebrate Women’s History Month. Women have always been a driving force behind human progress, and this month we celebrate their contributions to the world. With their exceptional abilities to create, design, and transform, women are already at the forefront in the field of architecture. In Nepal, as elsewhere in the world, more and more women are entering this field. Moreover, they have been using their architectural skills to design earthquake-resistant houses after the devastating earthquakes of April 2015, and in the process have become creative leaders and drivers of safe reconstruction around the country. So how are women architects contributing to reconstruction efforts in Nepal? What inspired and motivated them to be a part of the rebuilding process? What challenges have they faced and what are they learning on the way? As we celebrate International Women’s Day on March 8, we bring to you inspiring stories from four young women architects who work for Build Change and are contributing to locally adaptable and affordable reconstruction. For Ayusha, architecture is about creating something permanent that has a positive impact on people. She chose to become an architect because she was always intrigued by how buildings could affect the way we live, our mood, and behavior. Through architecture, she strives to influence people’s lives for the better. 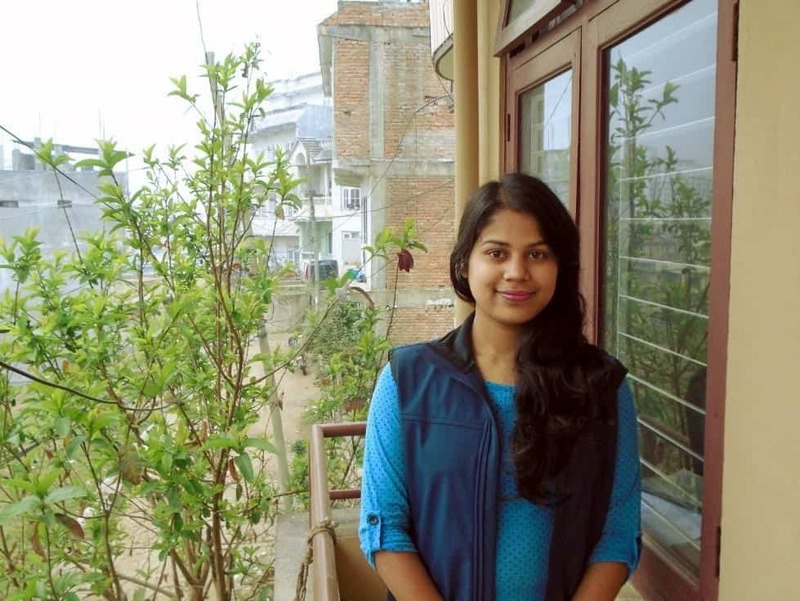 When the devastating earthquake hit Nepal in April 2015, Ayusha realized how she could use her skills to influence people’s lives by helping her country build back safer. She joined Build Change and started working in the remote earthquake-affected communities of Nepal. “As city dwellers, we spend the majority of our time in an urban environment and do not get to visit the remote communities of Nepal as often as we would like. Since there is such a difference between rebuilding in urban and rural environments, we need to develop a deeper understanding of rural communities and their rebuilding processes. 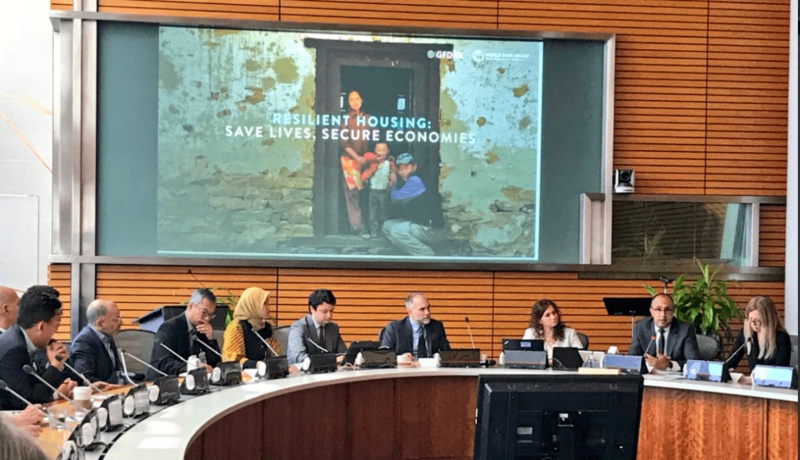 This was the reason why I was quite excited when I got an opportunity to be a part of sustainable rural housing reconstruction process,” she says. Being an architect and working in a community is quite a different strategy. “It is very different from working with commercial clients in urban areas. We need to consider the homeowners’ needs and requirements, the local architecture and construction techniques, and the impact of the project on the community,” she says. Initially, it was quite challenging for Ayusha and other female architects and engineers in the field to earn the trust of local community members. While working in the rural community of Kaule of Nuwakot district, homeowners only talked to the male architects and engineers, as they believed that men know best. Why would they waste their time talking to women? Over time, this perception has changed. Now, more and more homeowners seek technical assistance from the female technical staff. This is all thanks to Ayusha and other female technical staff in the field for their dedicated efforts! Kriti always wanted to build her career in architecture, a field of both art and technology, where one’s art is materialized at real scale. It was during her undergraduate studies when she realized that architecture could touch people’s lives for better, which has turned into her biggest motivation. When the disastrous earthquake struck Nepal in 2015, Kriti was studying for her Master’s degree in Infrastructure Planning in Germany. 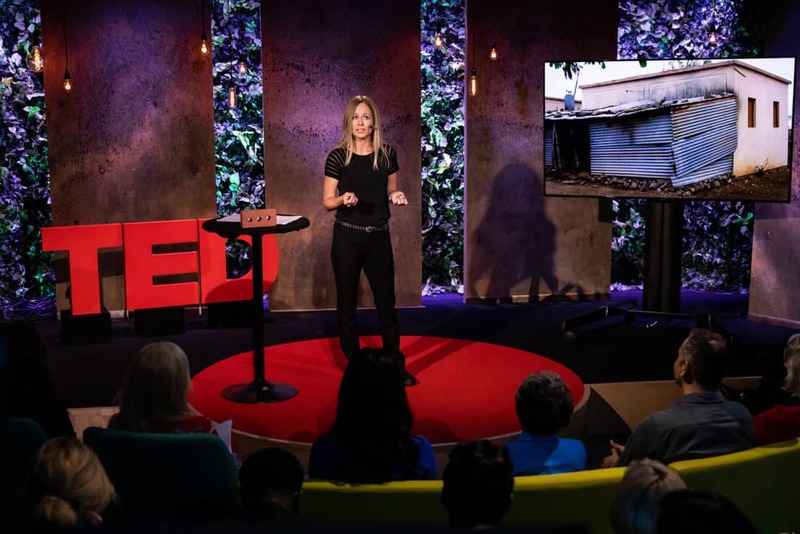 In the immediate aftermath, she considered how she could use her skills and experience to contribute to the reconstruction efforts of Nepal. She returned to Nepal after finishing her studies and joined Build Change. Kriti works within the technical team to design earthquake-resistant houses in rural areas, including both new construction and retrofits. She helped to establish the very first Technical Support Center (TSC) in Sindhupalchok district where she provided technical assistance and house design support to homeowners. 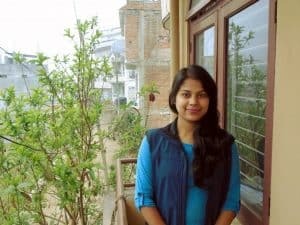 “My work has given me a deeper insight into the local context of Nepal, as well as an opportunity to create social impact through architecture.” Outside of Kriti’s work for Build Change, she is also actively helping to save heritage architecture in Dhulikhel through research and documentation. When asked about the challenges that women architects have to face, she says “it can be challenging at times for women to create their own identity in the construction industry.” But she believes that by showing sensitivity and perseverance, women will be able to prove that they can be leaders in the field of architecture. By expanding knowledge and pushing the boundaries of architecture, they can overcome any challenges. “I chose to become an architect because I have always been attracted to homes, art, and interior design,” says Salina. 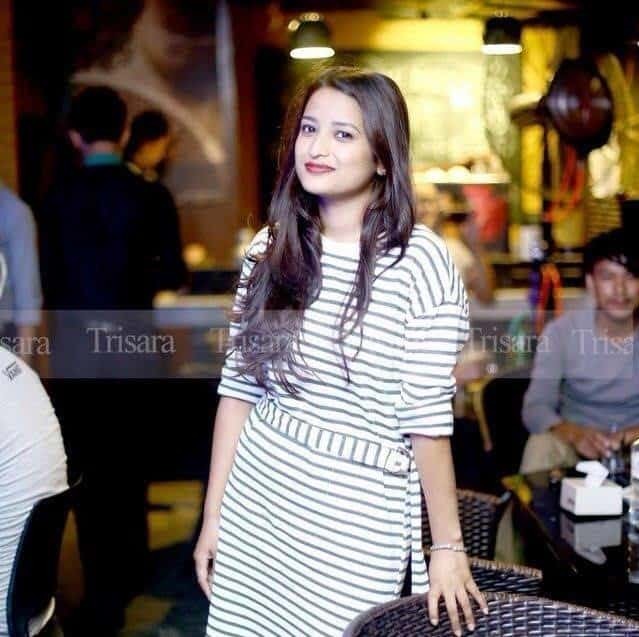 Previously Salina had been working as a commercial architect designing houses for wealthy people in Kathmandu. “Now I have become a social architect, designing houses to address the needs and cost considerations of the rural communities,” she says. 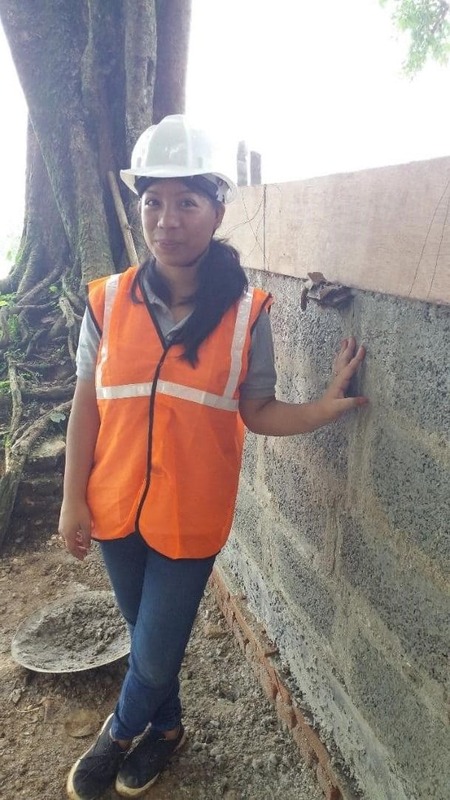 Salina had always wanted to work in the field of rural housing and development, and she is glad that she is getting an opportunity to use her knowledge and skills to contribute to the reconstruction process in Nepal. 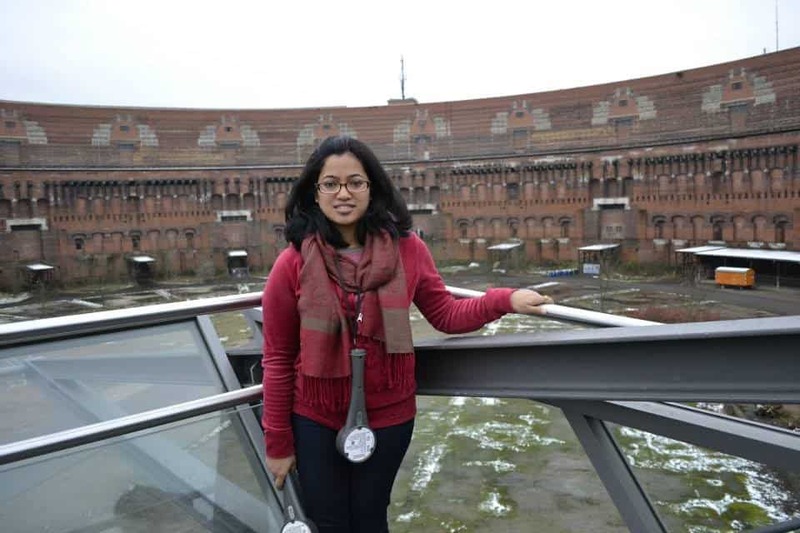 Regarding the challenges that women architects face, she says, “Although there are many female architecture students [in Nepal], when it comes to developing their careers they are constrained by their family and social responsibilities. In that sense, women architects are still relatively oppressed and it is difficult for them to take leadership roles within the field of architecture.” Salina believes that in order for women architects to excel professionally, they should always believe in their potential and should rise above social norms that constrain them to explore the limitless opportunities that architecture provides. To Ayusha, Kriti, Mansi, Salina, and everyone supporting the national rebuilding- a big THANK YOU for your contribution and inspiration in driving the reconstruction process and for setting an example for the next generation in Nepal and around the world! In October, I spent a few weeks at home in California with my family. Build Change’s annual event was also held during my time there, so I was able to meet the entire management team! While in California, I spent time getting familiar with building designs Build Change uses in Colombia, in preparation for my next assignment. I was able to review the Colombia Building Design Codes (referred to by their official name NSR-10), and the Build Change Evaluation and Retrofit Manual. I was also able to Skype with the team in Colombia to make sure I was up-to-speed on current projects. On October 17, I flew to Bogotá and spent my first week in Colombia with the Build Change staff in Bogotá. From my preparation for the trip, I knew that Bogotá is the capital of Colombia and sits 8,660 feet above sea level with a population of 8.1 million people. I was impressed by the high-rise brick clad residential buildings in the city, making the city very densely populated. I was taken aback by the informal brick residential housing dotting along the mountain slopes all around the city, and all I could think was how dangerous they would be in an earthquake. I was surprised how cold (average 60oF) it was being so close to the equator (4.7o N). One of the first things I noted was the difference in the Colombian Spanish dialect compared to what I was used to in California (mostly from Mexico). A business day on the streets of Bogotá felt like being on Wall Street, except the pace was a bit slower. Overall, I would recommend the taxis to get around the city. They are very efficient and will take you to-and-from the incredible restaurants around the city easily. Thankfully, the food in Colombia is not half as spicy as that in Indonesia! 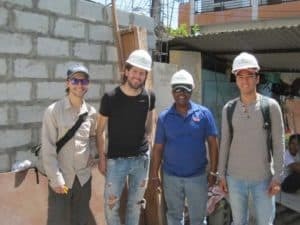 Upon arriving, Walter Cano, Build Change’s Project Engineer in Bogotá, immediately grabbed my ear to talk about the Build Change Evaluation and Retrofitting manual. In order to understand the manual and its implications better, we headed out to visit some of the neighborhoods and houses where Build Change is currently retrofitting houses and residential buildings. It gave me a unique insight into the work that the organization has done so far and equipped me with the understanding to support their projects for the upcoming weeks. buildings in hopes of getting a better understanding of possible incremental retrofit schemes of the existing buildings. I hoped that we could reduce the retrofit cost by establishing different performance levels (collapse prevention, life-safety, etc.) 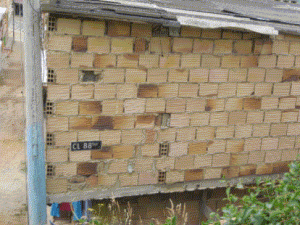 for houses that could benefit from retrofitting. Retrofitting involves a unique design and process for each house. In establishing these performance levels, Build Change may be able to work with more homeowners faster. 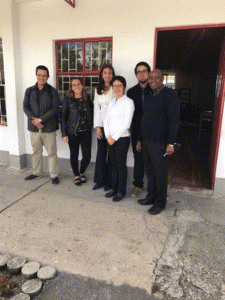 I also visited Professors Sandra Jerez and Nancy Torres at the Escuela Colombiana de Ingenieria (Colombian Engineering School) “Julio Garavito” regarding their full-scale wall testing project that they will be conducting for Build Change. We discussed the minimum expected test results to update the Build Change evaluation and retrofit manual. Testing will also be carried out on wall panels that Build Changes has harvested from existing buildings. The wall testing will begin in January 2018 and it was agreed that the University team will use this time to familiarize themselves with the Build Change Manual prior to commencing the tests. 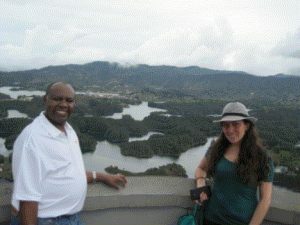 Starting the last week of October through November, I was based in Medellín, Colombia. Medellín, the second largest city in Colombia is located at 4900 feet above sea level with a population of 2.5 million. The beautiful city is very green and surrounded by mountains, making the scenery almost dreamlike. The weather was comfortable, temperate with an average of 75oF. 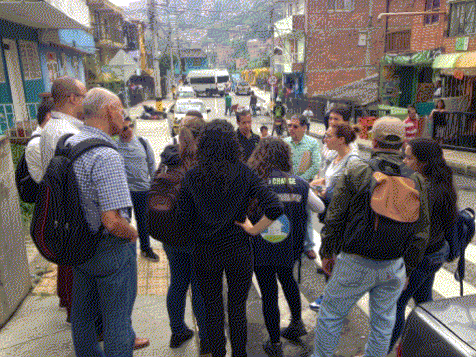 The formal housing is similar to Bogotá, as is the informal housing where about sixty percent of the population lives. What struck me was how clean the city was. Public transportation was very impressive and included a very efficient and clean metro tram system, metro cable cars that serve the mountainous informal housing communities, bicycles, taxis, and busses. During my time in Medellín, I accompanied the technical team to the Santa Margarita area of Medellín while they visited possible homes to be used for training building professionals (civil engineers, architects, and project managers) from the Medellín Social Institute for Housing and Habitat (ISVIMED) on how to implement the Build Change Retrofit Manual. I provided an in-depth review of Build Change Evaluation and Retrofit Manual. This included red-marking the manual not only to make it more user-friendly but also reviewing calculations for areas where the manual can be updated to make Build Change’s retrofit techniques more cost-effective. Additionally, I was able to accompany the technical team in the field in Santa Margarita as they trained building professionals from ISVIMED on how to implement the Manual. I was elated to meet with the doctoral student Alexis Osorio, who is working under Professor Ana Acevedo of Universidad EAFIT, Medellín. EAFIT will be conducting full-scale wall testing for both in-plane and out-of-plane behavior including shake table testing with Build Change. The results from these tests will also be coordinated with the testing from Julio Garavito Engineering School in order to have a better understanding of the wall systems using the different block types in Bogotá and Medellín. The test results will help in the updating of the Build Change manual. Homeowners receive subsidies from the government to fund home repairs. Most of the homeowners use this amount to upgrade kitchens and bathrooms, leaving a very small amount for structural components of the buildings. There is need to update the Build Change manual using the lessons we have learned from the wall testing and retrofit methods used recently. These are addressed in the current manual, but the goal is to make the structural retrofits even more affordable homeowners using the available government subsidies. Guatapé was one of the highlights of my time in Colombia. 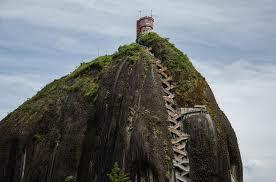 Located 81 km (50 miles) east of Medellín, the city has a beautiful array of colorful, historical buildings. After wandering the streets, we scaled the 747 steps of Piedra del Peñol, a giant granite rock extending 200 meters (650 feet) above ground. It was gorgeous! The journey to Padang, Indonesia started on August 3rd, 2017 in San Francisco, California with connections in Manila, Philippines and Jakarta, Indonesia. I arrived exhausted but excited in Padang on August 5th after almost 24 hours in the air. 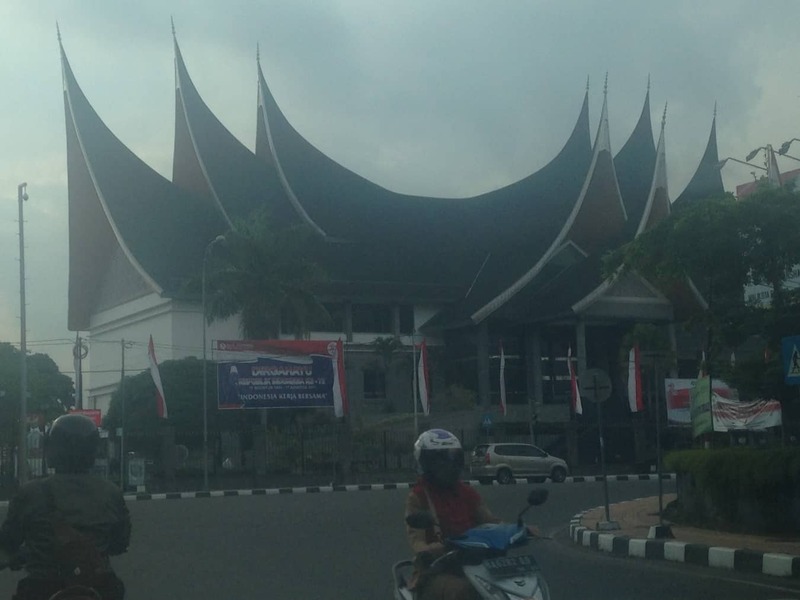 Padang is the provincial capital of West Sumatra and lies just south of the equator. The high temperatures are usually in the low 80’s, with lows hovering around the mid-70’s (Fahrenheit). I arrived in what is said to be “dry season” (May-September), although the high humidity and rain do not coincide with my experience of dry seasons elsewhere. I imagine the wet season (October ‐ April) is like living in a swimming pool. Padang’s old town lies in the low land, designated a tsunami red zone. The Build Change office is located in the higher ground (a tsunami green zone), as all of their offices are located in the safest areas of the cities where they work. The air is not what I would call “fresh”, but is relatively clean even with the heavy traffic of cars and motor bikes. 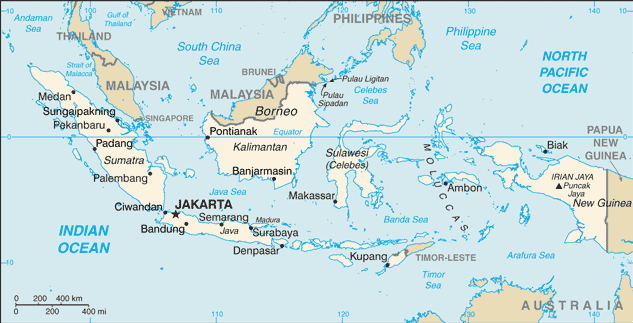 Although prior coming here I knew that the Indonesia archipelago is spread over the Pacific “Ring of Fire”, I did not know that Indonesia is made up of more than 17,000 islands; 6,000 of which are inhabited. 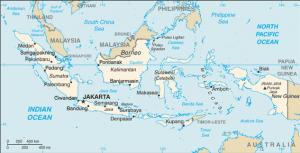 Indonesia is not only the fourth most populous country in the world (after China, India and USA) but is the most populous island nation in the world and spans three time zones from west to east. 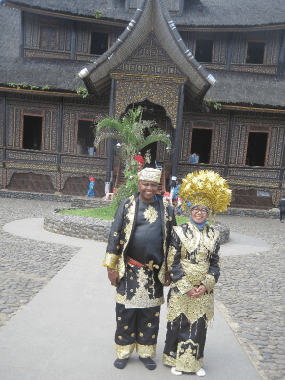 I was surprised to see the traditional Minangkabau house architecture incorporated in the government buildings and mosques of Padang, giving everything a uniquely Indonesian aesthetic. I was delighted to meet the very friendly Build Change team in Padang. They all made me feel at home on the first day, starting with setting me up with a SIM card for a local phone number, getting me settled at the hotel which would become my home for the coming months, and introducing me to Padang’s infamously spicy food. Luckily, rice is included in almost every dish which gives a slight reprieve from the searing (but delicious) flavors. The team is tight-knit, taking every opportunity to get together. Some favorite activities are celebrating birthdays, having lunch together, and going to karaoke nights. Throughout my stay in Indonesia, I primarily focused on working with the technical team on the School Safety Program initiatives. I helped the technical team to provide structural calculations, construction documents, a materials list, and a cost estimate for a new school building. I also helped the technical team to provide structural calculations, construction documents, a bill of quantities and a cost estimate for the retrofit of the 5-classroom building in SD42 school. I visited three other schools to assess the next possible representative school retrofit project. I visited a school site (SDN 40) under retrofit construction by others to familiarize myself with the school construction techniques. It was clear that the construction procedures did not follow the approved construction documents that were available at the construction site. There was no construction supervision of the builder’s activities, which was a sign that government direction needs to take a more significant role in the construction and retrofit of school buildings. Build Change focuses on the importance of involving all the stakeholders in the construction and retrofitting process. In this case, school headmasters would be the best supervisors, contractors are trained in how to follow approved construction documents, design engineers visit job sites for structural observations, and the government releases construction funding when major, supervised construction milestones are achieved. Build Change may need to play a lead role in organizing workshops for these various stakeholders so that they may improve and continue working together towards making schools safer. While visiting construction sites, it became clear to me that material quality plays a key role in the overall quality of construction. I accompanied the Build Change Better Building Materials (BBM) team to learn about and help them establish the quality of bricks being produced by brickmakers in the Padang area. 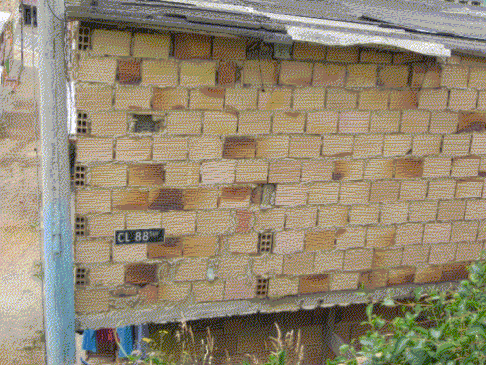 We visited a brick production kiln and collected brick samples for testing. We discussed possible changes in the typical kilns to make them more energy efficient, including alternative fuels (other than firewood) for environmental sustainability. I was also able to conduct a hands-on exercises for Build Change staff on making a “good” mortar and laying brick walls so that the team can use the experience in field supervision. Additionally, much of my time was spent reviewing government guidelines on design and construction of new and existing school buildings. All the reviewed documents were in Bahasa, the primary language in Indonesia, which was a slight issue as I am unfortunately not fluent in Bahasa. Thanks to Google Translate, online document translators, unit convertors, and the Build Change team, document revision went smoother than I initially expected. This may be the only time in my life where I thought to myself “well, I wish I learned Bahasa while working my way through multiple engineering degrees”. The National Standardization Agency (SNI)’s, Planning Procedures for the Earthquake Resistance of Buildings and Non‐Building Structures. Build Changes’ comments and suggestion were provided in form of a report. Tokyo. The seminar was on use of polypropylene bands mesh (PPBM) for home repairs, which I knew little about. Shake table test videos on the performance of PPBM application on buildings were presented. Before and after photos of an adobe building retrofitted with PPBM in Nepal following the 2015 earthquake were also presented. I had not seen this product before, however it seems to work well for out‐of‐plane retrofit of masonry walls. The PP‐bands are available in most developing countries in form of shipping ties. I am curious to know more, and was grateful to continue my own education about new and potentially useful products. 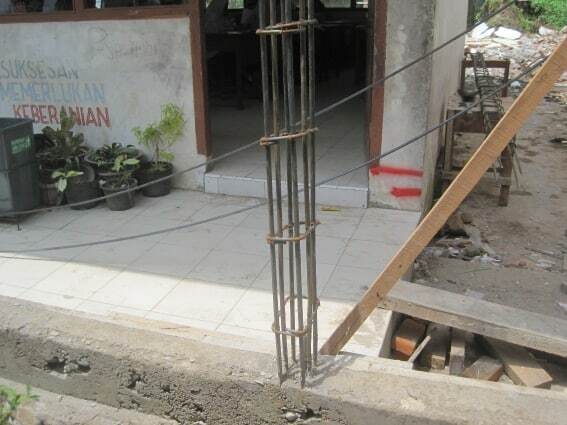 I was honored to participate in a Build Change Indonesia staff retreat and team capacity building activity in Pariaman. I served as a moderator of presentations by the technical team to the rest of the staff using the existing training materials on earthquakes and earthquake-resistant building construction. From this, I provided suggestions and helped the team with examples to make the presentations clearer and more accessible for a non-technical audience. The retreat culminated in fun group activities, including morning exercises and swimming in a popular water hole. It wasn’t all work, either! I was also able to visit a Minang village Chief’s palace museum and got to know the local customs in Padang Panjang. I have a new appreciation for the term “island nation” after snorkeling at Cubadak Paradiso Village in Cubadak Island. It was a truly breathtaking experience.